Yeah, I know I said I was just doing a post on the Hugo Study Committee Report and then I’d be done. 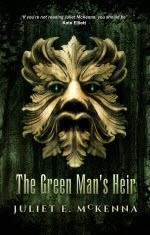 However, this morning I listened to the new episode of The Coode Street Podcast in which Gary and Jonathan talk to Jo Walton about her book, An Informal History of the Hugos. A couple of things Jo said had me sit up and take notice, so I thought I would write about them. The first point is an object lesson in how easy it is to think that something is traditional and has always been the way things were done. Jo, Gary and Jonathan were lamenting the lack of success that Iain M. Banks had in the Hugos. Jo noted that Banks had not had the advantage of the extra year of eligibility for works initially published outside the USA. That’s a rule I know well, and I was slightly surprised, so I checked the history. It was in 2002 that we added a rule giving works in English published outside the UK a shot at an extra year, but you needed a 3/4 vote in the Business Meeting. It wasn’t until 2014 that the extra year became automatic. So Jo was right, Banks did not get to use this feature of the Hugo rules. It is much more recent than I rememered. Jo also mentioned that Hugo participation, in terms of numbers of voters, was increasing, and noted the effect of the Puppies on this. 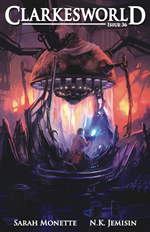 Given that it is my job to worry about bandwidth limits on the Hugo Awards website, I figured that the story wasn’t that simple, and I was right. 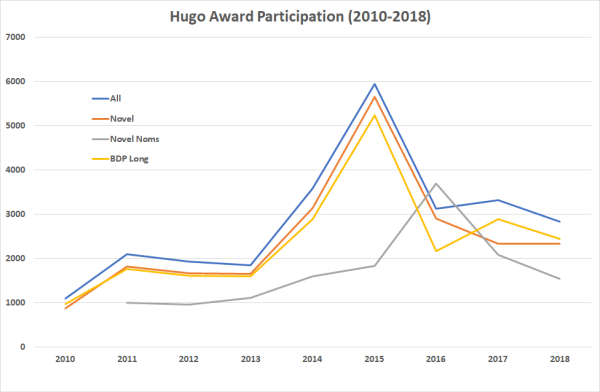 The following chart shows the total number of Hugo voters in the Final Ballot stage, the numbers that nominated in Novel, and the number of Final Ballots that express a preference in the Novel and Best Dramatic Presentation: Long categories. These are the categories that traditionally get the most interest. I stopped my historical digging at 2009 because that year’s data did not give separate participation data for each category. The level of participation is almost 3 times what it was in 2009, but it has dropped significantly since the peak of 2015 when all fandom came together to repell the Puppy Incursion. What’s more it appears to be still dropping. That’s not altogether surprising, but it is something we need to be concerned about. There are some interesting pieces of data as well. 2016 is notable in being a year (probably the only year) in which the number of voters participating in the nominating stage is higher than the number participating in the final ballot. That’s becaue a lot of people joined the 2015 Worldcon to join the fight against the Puppies, and were eligible to nominate in 2016, but having seen that the Puppies were mostly beaten they opted not to join again. 2017 is notable for being a year where a lot of people who particpated in the final ballot did not vote in the Novel category. That’s why I checked BDP: Long. Sure enough, I found that a lot more people participated in that than in Novel, which is also unusual. The obvious reason is that a significant number of voters were not native English speakers. While most Finns have very good English, reading six whole novels must have seemed a bit daunting. Movies were quite likely subtitle or translated. 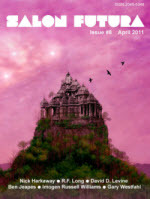 This entry was posted in Awards, Podcasts, Science Fiction. Bookmark the permalink.